The Very Rev. 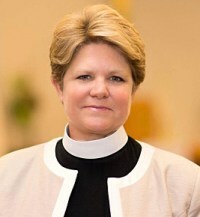 Dr. DeDe Duncan-Probe (currently rector of St. Peter’s in the Woods Church in Fairfax Station, Virginia) was elected 6 August to be the 11th bishop (and first female bishop) of the Episcopal Diocese of Central New York. Duncan-Probe will succeed Bishop Gladstone B. “Skip” Adams III. Bishop Skip served the Diocese of Central New York for more than 15 years and has been called to serve as provisional bishop of the Episcopal Church in South Carolina. Duncan-Probe, a priest in the Diocese of Virginia, has served as the rector of St. Peter’s in the Woods Church since 2009, guiding the parish through significant growth and revitalization. Previously, she served at All Saints’ Church in Stoneham, Massachusetts, St. John’s Episcopal Church in McLean, Virginia, and Holy Comforter in Vienna, Virginia. Prior to her ordination to the priesthood in 2004, she served as a youth director and as an educator, and co-founded an engineering consulting firm with her husband. “The thing I’m looking forward to at the Diocese of Central New York is continuing their ministry of reaching out to the local communities, of making a difference in the lives of all people, gathering people together for strength and support, and really living the message of Jesus Christ,” says Duncan-Probe. “In the 21st century I view the role of bishop as a return to this level of personal, social, and religious engagement, actively responding to societal and individual needs through relationship and by proclaiming the love of Christ in transformative and life-giving ways for all people.” Click here for more information about our 11th bishop.